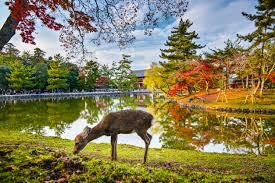 Nara Park is a public park located in the city of Nara, Japan, at the foot of Mount Wakakusa. Established in 1880 it is one of the oldest parks in Japan. 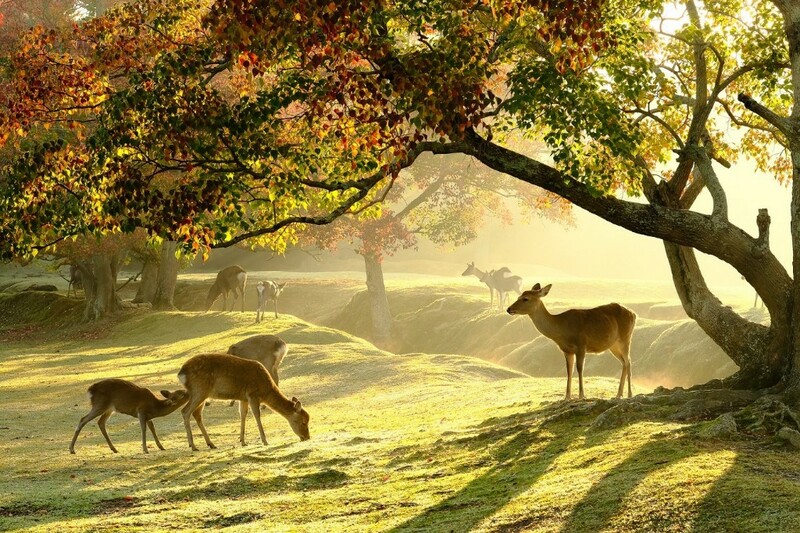 Administratively, the park is under the control of Nara Prefecture. The park is one of the "Places of Scenic Beauty" designated by the Ministry of Education, Culture, Sports, Science and Technology (MEXT). Over 1,200 wild sika deer freely roaming around in the park are also under designation of MEXT, classified as natural treasure. While the official size of the park is about 502 hectares (1,240 acres), the area including the grounds of Tōdai-ji, Kōfuku-ji, and Kasuga Shrine, which are either on the edge or surrounded by Nara Park, is as large as 660 hectares (1,600 acres). Jinrikisha services can be found near the entrances to popular sites as Tōdai-ji or Kōfuku-ji. While Nara Park is usually associated with the broad areas of the temples and the park proper, previously private gardens are now open to public. These gardens make use of the temple buildings as adjunct features of their landscapes. The park is home to the Nara National Museum and Todai-ji, where the largest wooden building in the world houses a 15-metre (50 ft) tall statue of Buddha.